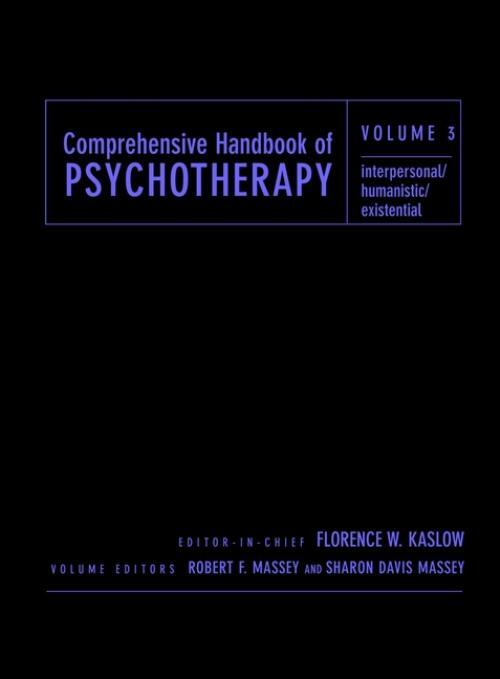 In this volume, theoretical frames, modalities, and applications are examined for Interpersonal/Humanistic/Existential psychotherapy. Topics range from "Culturally Sensitive Psychotherapy with Children" to "Spiritually Sensitive Therapy" and "Existential Treatment with HIV/AIDS clients." SECTION ONE: PSYCHOTHERAPY WITH CHILDREN. Chapter 1. Structural Family Therapy: An Elaboration of Theory and Practice (C. Wayne Jones and Marion Lindblad–Goldberg). Chapter 2. The Central Role of Culture: Working with Asian Children and Families (Christine M. Chao). Chapter 3. Play in Therapy with Abused Children (Eliana Gil). Chapter 4. Existential/Experiential Approaches to Child and Family Psychotherapy (Volker Thomas). Chapter 5. A Biopsychosocial Approach to Play Therapy with Maltreated Children (Laura Palmer, Anne R. Farrar and Nouriman Ghahary). SECTION TWO: PSYCHOTHERAPY WITH ADOLESCENTS AND YOUNG ADULTS. Chapter 6. Solution–Focused Brief Therapy with Adolescents (Joel K. Simon and Insoo Kim Berg). Chapter 7. An Integrative Approach to Assessment and Intervention with Adolescents of Color (Arpana G. Inman, Kwamia N. Rawls, Marisol M. Meza and Andraé L. Brown). Chapter 8. Adlerian Therapy: A Century of Tradition and Research (Robert Sherman and Anselm Nwaorgu). Chapter 9. School–Based Community Family Therapy for Adolescents at Risk (Norbert A. Wetzel and Hinda Winawer). SECTION THREE: PSYCHOTHERAPY WITH ADULTS. Chapter 10. A Relational–Cultural Perspective in Therapy (Judith V. Jordan). Chapter 11. Existential/Humanistic Psychotherapy (Paul E. Bracke and James F. T. Bugental). Chapter 12. Spiritually–Sensitive Psychotherapy (Harry J. Aponte). Chapter 13. Existential Treatment with HIV/AIDS Clients (Eugene W. Farber). Chapter 14. Logotherapy (Elisabeth Lukas and Bianca Zwang Hirsch). SECTION FOUR. PSYCHOTHERAPY WITH FAMILIES AND COUPLES. Chapter 15. Couple Therapy as Transforming Process: Reflections on Couples Stories (Maurizio Andolfi, (Joseph Kabali, Translator). Chapter 16. Existential Dilemmas and Skill Building in Couple Therapy (Adriana Balaguer Dunn). Chapter 17. Resilience and Human Rights Activism in Women′s Life Stories (Pilar Hernández and Janine Roberts). Chapter 18. Redecision Family Therapy (Vann S. Joines). Chapter 19. Contextual Therapy (Catherine Ducommun–Nagy). Chapter 20. Systems as Interconnecting Social–Psychological Processes: Existential Foundations of Families (Robert F. Massey). Chapter 21. Psychodrama (Alan Jacobs). Chapter 22. Transactional Analysis (Robert F. Massey, Gordon Hewitt and Carlo Moiso). Chapter 23. Body–Centered Psychotherapy (William F. Cornell). Chapter 24. Biopsychosocial and Spiritual Treatment of Trauma (Anie Kalayjian). Chapter 25. International Perspectives on Professional Ethics (Marilyn Peterson Armour, Ingeborg Haug, with Dorothy Becvar, Helen Braun, Mony Elkaim, Shibusawa Fazuko and Augustine Nwoye). Chapter 26. An Interpersonal–Systemic and Developmental Approach to Supervision (Sharon Davis Massey and Linda Combs). Chapter 27. Humanistic, Interpersonal, and Existential Psychotherapies: Review and Synthesis (Sharon Davis Massey).